Many years ago I worked for Sun Microsystems in Burlington, Massachusetts. There was a terrific little Thai restaurant called Lemon Tree within walking distance of my office. I went there often, usually by car (do you know how COLD it gets in Boston?) and one of my favorite meals was chicken with mango. It’s been a long time since I’ve been to Lemon Tree but this green curry chicken with mango reminds me of theirs. Another thing I loved about Lemon Tree was the nutritional information their menu provided. Next to hot and sour soup, it might say “Have a cold? Pick this soup.” If you were unfamiliar with tamarind, they offered this: “Tamarind is an excellent source of potassium, magnesium, and thiamine and iron. It contains phosphorus, riboflavin, niacin, calcium, and vitamin C, as well as fiber. It is said to be laxative, to stimulate biliation, and to aid the liver. Try our Tamarind Pork.” I love this kind of information on a menu! I enjoy Thai food but don’t have many opportunities to eat it unless I’m on the road. When I try making it myself, I have trouble finding individual ingredients such as galangal and lemongrass. When Savory Spice Shop sent me a sample of their Thai Green Curry, I decided to try recreating Lemon Tree’s chicken and mango dish. This one spice blend contains galangal, cumin, coriander, lemongrass, red Thai chiles, Lampong peppercorns, cilantro, Kaffir lime leaves, jalapeño, shallots, garlic and mild green chile powder. It’s also salt-free. In this version of green curry chicken, the mango offers sweetness, the curry blend is spicy, the vegetables are slightly crunchy and the coconut milk and half and half lend creaminess. I thought about throwing in some hot peppers, but I’m glad I didn’t. The curry blend had plenty of heat. The one ingredient I will add next time is basil, preferably Thai basil if I can find it somewhere or grow it myself. 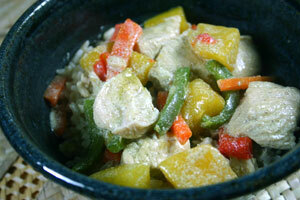 Would you like to win a sampler of curry blends from Savory Spice Shop, including Thai Green Curry? Enter the giveaway by making a comment on my Vadouvan Curry-Dusted Scallops with Apple Broth post before Friday, April 20, 2012. Disclaimer: I received a free sample of Thai Green Curry blend from Savory Spice Shop. Combine half of green curry paste with chicken cubes; set aside. Heat olive oil in a wok over high heat. Add onions and garlic and stir-fry for about 1 minute. Add coconut milk and remaining green curry paste. Cook, stirring, for about 5 minutes. Add fish sauce and bring to a boil. Add chicken, bell peppers, carrots, half and half and tapioca starch mixture. Bring to another boil, then reduce heat to low and simmer until sauce thickens, about 15 minutes. Add mango and heat through. In a small bowl, mix curry blend, oil and water together to form paste. Nutritional Analysis: Almost all of the sodium in this recipe is coming from the fish sauce. If you are watching sodium, you may want to use less fish sauce. The fat, especially the saturated fat, is coming from the light coconut milk. Even “light” has a lot of fat. If fat is a concern, you may want to replace some of the coconut milk with coconut water or water plus a bit of coconut extract.